Do you know what a motivational reward is? Does it sound like something you might like to try for your classroom management? "Yes! Absolutely, I would love to try this management technique!" But, what if you are not a classroom teacher? If you are a specialist or an award user this post might give you a few ideas! Before you read any further think about this: What management plan and reward system do you use? Y'all, I am old enough to remember learning about Assertive Discipline and back then we wrote kids' names on the board when they broke a rule. Subsequent problems each day resulted in a check mark beside your name. The number of check marks determined the consequence each day. Does anybody remember this? Then we progressed to "pulling cards" and then we jumped into Clip Charts. Fast forward a tiny bit more and you have reward options like these cute little necklace strips. So, this is an intriguing management and reward system. The great part is that kids are awarded these strips for generic moments in which everyone receives one. So, no one is ever left completely out- that would be equivalent to the child that gets his or her name on the board and four check marks in one day! There are ten tons of other positive reasons reward strips are popular now and I thought about using these a lot. I am a specialist. I have 27 classes. Could I really make use of a reward chain, necklace, strip combo for 500+ students? And then I had a Brain Pop moment. One morning one of my classes arrived and they were all wearing their reward necklaces. I asked about it and was told they had all received a strip that morning and as an additional reward they were able to wear their necklaces for a little while. This got me to thinking......since this particular class uses this system, could I make some just for STEM and award them? So, of course, I dashed home that afternoon and started playing around with this idea and setting out to find a way to make it work! Here's some ideas for you about using this system- if you are specialist. At the end, I will address what to do if you are a classroom teacher! 1 -Adapt rewards for your specialty. My "Special" is STEM, so I made some awards that are generic for that and these will be the ones every student earns. I love the way this one turned out and I made some that just say Engineer and Scientist and First STEM Project. These generic rewards could be the ones you give out on the first day of school. Right now I only have three classes out of my schedule that are using the necklaces so this is allowing me to decide how to do this! The rewards I made come in three styles and one of those is black/white so when I need to make a lot of these I will copy those on Astro-Bright card stock. 2- What's your plan for handing out rewards? So, after I made a batch of rewards, I started wondering how on earth I was going to remember all the topics I used and then hand these out appropriately. It seemed daunting. Then I thought about this: What if I choose one specific reward and only focus my attention on noticing students or groups that are following that reward's motivational topic. Say.....I decide to focus on Math Matters. As kids are working I can jot down names of students that I see using rulers, math calculations, vocabulary, or anything else math related for the project. So, I tried this and guess what? It was super easy to do! I watched for Fabulous Planning and noticed a few groups that were really working on their sketches and talking through what they wanted to do- I even heard a group talking about their "Plan B"! So, at the end of class, I slipped a reward to those students. Yes, this got everyone's attention! So, what happened when that class arrived the next week? 3 - How do kids earn a reward from you? After a week the class came back and in the first few minutes, a student asked if I was doing rewards that day. When I said there would be some given out, I got a lot of questions! What are you looking for? What are the different things we can get? Could everybody get one? This is when I had another brain pop! What if I had the class decide what they would work for? So, I displayed three rewards, they voted, and we all focused on that one specific STEM attribute which was Never Give Up! Perfect- kids were as engaged as always, but I saw some perseverance that was astounding that day- they really were working to earn the reward! 4 - Get the kids involved in handing out rewards! We kept trying the two ideas already mentioned- either I chose the reward or the kids voted and helped choose. Then I had another brain pop. What if the kids could be part of awarding rewards? So, we tried that. I displayed four rewards - one of which was Artistic Flair. At the end of class, I asked each group to decide if anyone within the group had earned any of those four rewards. The talk about this was intense, but also very encouraging. The kids were focusing on positive behaviors and citing reasons for it. Yes, we gave out a lot of rewards that day because most groups had something that each of the students did well. This was important because a kid said this, "Today we all got something that was about the part we had in the group." And, if you will think about that it's the truth. Every student brings something different to the teamwork! What about getting the classroom teacher involved? So, how can you do this as a specialist and get the classroom teacher involved, too? Talk to your classroom teachers and let them know what you are doing and also that the kids might be coming back with rewards to add to their collections. The teacher may have some ideas for other ways kids can earn these! 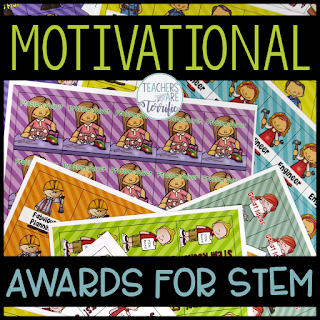 If you are a regular classroom teacher and use STEM in your room, certainly grab a set of STEM rewards and add these to the ones you give out. Use any of the ideas already given in this message! Watch for one particular attribute or let the kids get involved with it. It's such a fun way to recognize those positive things kids do! Here's a link to my Motivational Rewards just click on the image! I love your ideas about using brag tags for STEM. In my school, I am the STEM special teacher, but none of the classroom teachers use brag tags. Do you have any thoughts on how I could use these in this case? I see each class in the school (1st-5th, 4 classes each) once a week. Sounds like our jobs are very similar! The only thing that comes to mind about using brag tags is to award them to groups that show a specific trait, give a tag to each student in the group, and let them collect them on a string. At the end of the year each student would take them home. My problem is the number of students I have- using brag tags with all of them would be really difficult. The expense of printing them and then storing that many strands of tags would be hard. It's only working for me right now because I only have two classes that get the tags. I wish I had some better ideas for you! Thanks for the inquiry!